The final view from Ted in this current crop of Carlisle views. Ted says that hasn't a clue where this is, but someone might know. The location may be some way north of Carlisle Citadel Station but south of Port Carlisle Junction, as it is reminiscent of a photograph I have dating from c1910, showing a West Coast Express behind a Dunalastair III locomotive, with the overbridge in the background. The Caledonian Railway mainline would be the line on the far left, while the double line on the right, which looks to be recently laid, could either be the line to the Caledonian goods depot or the Goods Traffic Committee line (CAL, G&SW, L&NW, and MID). There was a connection from the latter to the West Coast mainline at Calcew Junction. The signals in the photograph, which I assume is one of the 1878 views, are clearly not L&NWR but probably Caledonian. I wonder if this might be looking north at Caldew Bridge/Irish Gate Brow? If so that would be the 'Old Carlisle Brewery' in the left background? I think this is described as Dentonholme North Junction, indeed there is a signalbox in the background in front of the bridge. Interestingly there is a contractor's engine on what appears to be a roadway running down from the bridge. I asked my the editor of the Industrial Locomotive about this and he was familiar with the picture and I quote from a discussion he had had about it: "the style of the tank, the shape of the smokebox base, and the presence of side footplates suggest to me that this is from one of the Kilmarnock builders, not Neilson. I have that Ireland & Co had 0-4-0ST Andrew Barclay works number 108 of 1871 at Carlisle, but unfortunately this was on the Dentonholme goods depot contract in 1880-83, rather later than the photo. The loco was on the Dentonholme contract 'by 3/1883' which sounds like a spares record". Further to my previous email I have checked the names of the two junctions cited. They should be corrected to 'Port Carlisle Branch Junction' and 'Caldew Junction' respectively. I have also checked the print in my possesion and it is recognisably the same location, although the photograph only shows the Caledonian main line. I had assumed the view is looking south but now agree it is looking north. I have looked on Google Maps and the slope down from the A595 road bridge is now Viaduct Estate Road, which is on the south side of the bridge. The double line is therefore the Caledonian main line, and the lines on the left, which do not exist today, were the Goods Traffic Committee or Caledonian goods lines. This is just north of Citadel station. The large wall on the RHS is known as West Walls and the two tracks immediately under it on the RHS are now the main line north, in fact the only lines north. The lower area on the left is now a car park. In the distance is the road bridge for the main road to the west. On the other side of it to the right is Carlisle Castle and to the left is the old state owned Carlisle Brewery, now flats, its chimney can be seen in the picture. I used to work just round the corner! his is Caldew Junction with the Caledonian main line on the right having left Citadel Station. In the left foreground would have been the late Dentonholme North Junction Signalbox which signalled the Goods Lines. The Caledonian Yard to the left of the main line. 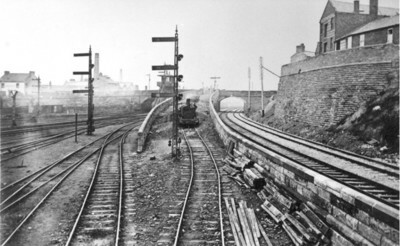 This is a view of the new Caley main line at Carlisle looking north taken by Annan of Glasgow in about 1878. The old main line is on the left - with the foreground tracks becoming the access into the Caley's Viaduct Yard. The bridge is known locally as Caldewgate Bridge and carries the main road to the west. The chimney is that of one of Carlisle's several breweries and this one was to survive until the 1980s, for many years as the Carlisle State Brewery. The photo forms one of a set of prints which record the great rebuilding in Carlisle of the 1870s - original prints are held in the Carlisle Library - large, probably 12x16 or 16x20 contact prints. Herewith a print showing Dunalastair III no. 902 with what looks like the Carlisle Brewery in the background, which means the train was travelling south towards Citadel Station. Can anyone explain please the arrangement of lines north of Citadel, as this train appears to be on the far side of the goods lines, and not on the double line on the right of the mystery photograph, which has been established is today's West Coast Main Line? When compared with Ordnance Survey town plans the photograph shows how much property had to be demolished to make way for the CR's new main line; not to mention the other railway works shown in previous pictures and others not, the Dentonholme Joint Goods (MR & GSWR) for example. Expansion of Citadel station involved building Victoria Viaduct and enlarging the Nelson Bridge between the city (Carlisle) and Dentonholme. Carlisle must have seemed like one huge building site in the last twenty or so years of the nineteenth century. In their time railways were just as disruptive as a new road is today. The rails of the new mainline appear to be dull suggesting that it was not in use when the photograph was taken but this may be because of the angle of the view. The road way (known as Viaduct Estate Road now) and the walls are pretty much the same as shown today but the railway property to the left and behind the photographer are occupied by industrial buildings and the University of Cumbria Library. It's a good place to watch comings and goings on the WCML. Turning to Gareth Spencer's view of the CR Dunalastair III; it appears to be passing the south end of Dentonholme North Junction taking the Goods Traffic Committee Line which would take the train via Rome Street and Bog Junctions to the LNWR at Upperby; it cannot be heading to Carlisle Citadel as there was no connection, after the remodelling, from the station to the north other than the CR mainline shown in the mystery picture. A special working not stopping at Carlisle but changing engines at Upperby; however if this were the case the route would more likely have been through Citadel station on either through or platform roads. An empty stock working (I think the CR semaphores relate to route not class of train); there were many empty stock working in later years when passenger demand at certain periods was tidal. A regular train working round an accident on the approaches to Carlisle Citadel. I'm not sure how a blockage would have been dealt with but the railways must have had some provision for such events. Perhaps backing trains in and out of the station from Upperby or services from Penrith? Click here for a photograph of a Glasgow & South Western Railway train which is clearly of the same location and period as that of the Dunalastair III circa 1910. The locomotive is a Manson '240' Class 4-4-0 No. 253 and the Head Signals appear to indicate an ordinary passenger train. With regard to Steve Simpson's contribution, we now have photographs of two south bound passenger trains taking a route avoiding Citadel Station. The presence of a horsebox might suggest that the empty stock working explanation is unlikely. Gareth Spencer's photo of a GSWR train is in exactly the same location as the CR Dunalastair III and so it seems is the photographer. The GSWR train is a 'stopping train' and, apart from the horse box and breaks, is remarkably uniform. All we need now are photographs of NBR trains off the Waverley Route and the Port Carlisle/Silloth branch for a full set! If the pictures are taken by the same photographer on the same day then the question arises as to whether there was permanent way work underway on the northern approach to Citadel station, or are the pictures posed? Neither locomotive appears to have a sense of motion, no steam or smoke and no crew, which might suggest posed shots but for who and why? An article about Carlisle in the Railway Magazine perhaps? The two trains in the pictures from Gareth Spencer are heading north just at Port Carlisle Branch Junction. The bridge in the background would at the time have been Caldew Bridge. The G&SW train is a down semi-fast according the the note on the back of my copy. The note is written by H. Gordon Tidey who took both pictures. They were probably taken in 1912 and were both published in Railway and Travel Monthly volume 6, 1913. The CR loco as said to be on a Euston-Glasgow dining car train. The track layout would support John Alsop's contribution that Gareth Spencer's photographs are at Port Carlisle Branch Junction and as the photographer has endorsed them as such seems to make the point certain; it also clears up any question as to why the trains appear to be running around Citadel Station - they have in fact come from Citadel. There are two question which it does not answer. From OS mapping it would appear that the Port Carlisle Branch at this point was four track - two from the Goods traffic Committee Lines on the west (right in the pictures) and two from the CR main line. In this case the trains appear to be moving from the CR main line to the Port Carlisle Branch - why would CR and GSW trains be doing this? The chimneys: in the original photograph these are clearly to the north of the Caldew Bridge and west of the railway - just right for Carlisle Old Brewery and this view is looking north. In the two secondary pictures the chimneys should be in front of the Caldew Bridge (it is still the Caldew Bridge today by the way) and on the right hand side of the line. If the chimneys in Gareth Spencer's views are to the east of the line and south of Caldew Bridge what are they? A further question in relation to the CR and GSW locomotives being at Port Carlisle Branch Junction is what are the buildings to the left of the locomotives (east of the railway)? This area has always been open ground with no development shown on any OS mapping and as the rear ends of the trains would be on bridge over the Caldew the river's course north and east of the bridge is very close to the railway precluding any buildings at this point. A (relatively) modern photograph at the same point but looking the other way is at page 140 of the March 2012 issue of Steam Days magazine. This photo was previously published in the Journal of the Historical Model Railway Society Volume 6, no. 2 (April1968) with a commentary by Charles Underhill. He gives the date as 1877.